The Grumman AF Guardian was the first purpose-built anti-submarine warfare (ASW) aircraft system to enter service in the United States Navy. It consisted of two airframes, one for detection gear, the other for weapons. 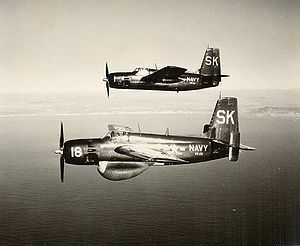 It was replaced by the Grumman S-2 Tracker, the first purpose-built single airframe ASW airplane to serve the U.S. Navy. 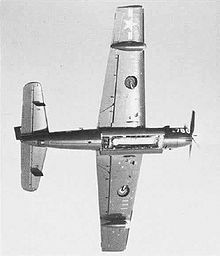 The original design, the XTB2F of 1944, was to be a twin-engined aircraft with a 3,600 lb (1,633 kg) warload and a range of 3,700 mi (5,950 km). This was considered to be too large for practical use from an Essex class aircraft carrier, and was canceled in 1945, replaced by a modified F7F Tigercat, the XTSF-1. However, another alternative, the internally-developed Model G-70, was selected instead, and given the Navy designation XTB3F. This was designed as mixed-power aircraft, with a Pratt & Whitney Double Wasp radial engine in the nose and a Westinghouse 19XB turbojet in the tail. This was found to be unsuitable and the jet engine was removed without ever having been used in flight. The XTB3F-1S carried a crew of two seated side-by-side and an armament of two 20 mm cannon and 4,000 lb (1,814 kg) of bombs, torpedoes and/or rockets, and made its first flight on 19 December 1945. On 24 December 1945, the Navy changed the role of the aircraft from torpedo-bomber to anti-submarine warfare. All the required equipment could not be fitted into a single aircraft, consequently two variants would be produced, one as a "hunter" and another as a "killer." The "hunter" aircraft would not carry any armament, but instead two additional crew members and a ventral radome for APS-20 search radar. This aircraft, the XTB3F-1S, first flew in November 1948. The "killer" deleted the cannon of the torpedo bomber, but retained the bomb bay, added a third crewmember, a searchlight, and short-range radar, and (as the XTB3F-2S) first flew in January 1949. Picture - An AF-2S of the Museum of Naval Aviation in the colors of VS-25 pictured while owned by Aero Union Corporation, circa 1978/79. Redesignated as AF-2W (TB3F-1S) and AF-2S (TB3F-2S), the Guardian entered service in October 1950 as the largest single-engine, piston-engined aircraft ever used by the US Navy. A total of 193 AF-2S Guardians were built. In 1952, the "hunter" AF-3S was introduced, fitting a magnetic anomaly detector (MAD) for the detection of submerged submarines; 40 of this variant were built. The last Guardian was delivered to the Navy in March 1953, with a total of 389 built. 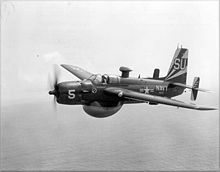 The Guardian saw service in the patrol role during the Korean war, however, shortly afterward, it began to be replaced by the Grumman S2F Tracker, with the last AF retired on 31 August 1955. The Guardian was used as a landbased and carrier ASW aircraft by the US Naval Air Reserve during the period just prior to its replacement by the Grumman S2F Tracker and in conjunction with the Lockheed P2V (P-2) Neptune. It was used extensively on the East Coast for ASW Patrol and training for the Naval Reserve, Willow Grove NAS being one of the main training bases for the central East Coast area. After disposal by the U.S. Navy, several Guardians saw many years service with Aero Union based at Chico California in the forest fire-fighting role. One ex Aero Union AF-2S is on display at the National Museum of Naval Aviation in Pensacola, Florida and another is preserved at the Pima Air Museum, Tucson, Arizona. XTB3F-1 Three prototypes of two-seat torpedo bomber powered by two 2,300 hp R-2800-46 engines and a Westinghouse turbojet. XTB3F-1S One XTB3F-1 with turbojet removed and ventral radome , later re-designated as XAF-1. AF-2S Production variant with 2,400 hp R-2800-48 engines, 190 built. AF-2W Hunter variant with search radar in a ventral radome, 156 built. AF-3S Hunter/Killer variant similar to AF-2S with retractable MAD boom, 25 built. Donald, David and Daniel J. March. Carrier Aviation Air Power Directory. Norwalk, CT: AIRtime Publishing, 2001. ISBN 1-880588-43-9. Gunston, Bill. Grumman: Sixty Years of Excellence. New York: Orion Books, 1988. ISBN 0-517-56796-2. Swanborough, Gordon and Peter M. Bowers. United States Navy Aircraft since 1911. London: Putnam, Second edition, 1976. ISBN 0-370-10054-9. Thruelsen, Richard. The Grumman Story. New York: Praeger Publishers, Inc., 1976. ISBN 0-275-54260-2. Grumman AF Guardian Pictures and Grumman AF Guardian for Sale.